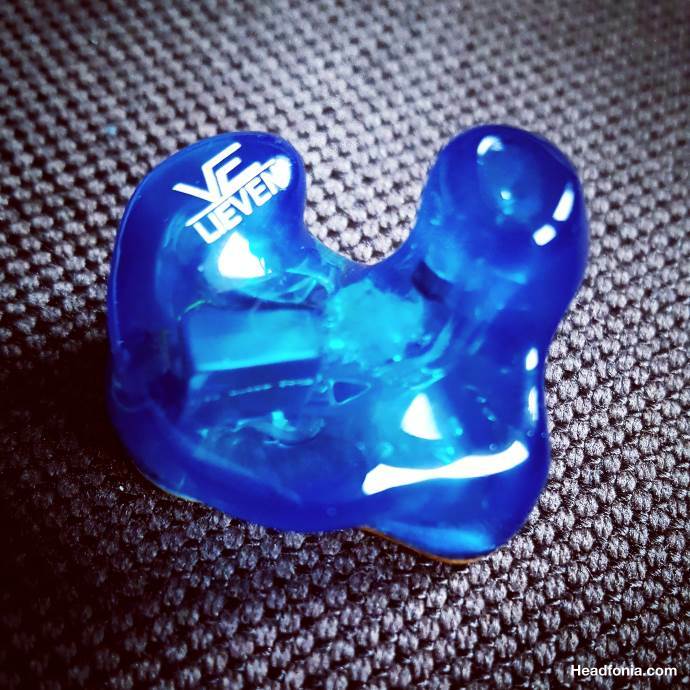 Disclaimer: Vision Ears sent us the Vison Ears VE8 free of charge in exchange for the review. The unit is a custom version and it doesn’t need to be returned. Vision Ears isn’t a site advertiser. If you’ve been following and reading HFN, than you certainly know this isn’t the first time we talk about the German Vision Ears. It’s been a while though as it was back in June 2015 that we reviewed their VE5 monitor and visited the guys in their lab. 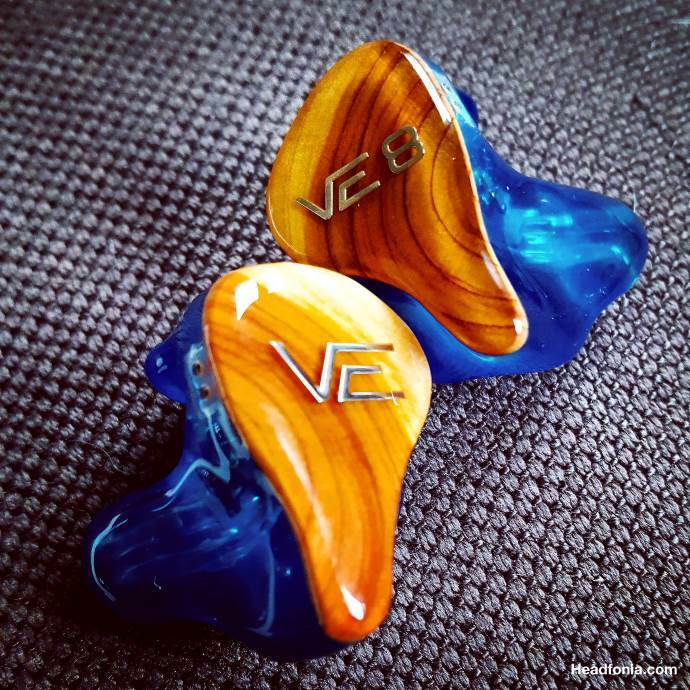 Not a lot of news came from VE since then but now they’re back with a new reference model, the Vision Ears VE8. For those of you that aren’t familiar with Vision Ears yet, here’s some info. Vision Ears is located in the heart of Cologne, Germany and they’re devoted to developing and producing their custom made In-Ears with great passion. Marcel Schoenen and Amin Karimpour were working for the same CIEM company last decade and they were linked by their vision of highest quality and outstanding customer service. After a few years of separation, the two got reunited and VISION EARS was born. Since 2013, the headquarters of Vision Ears is located in the Luxemburgerstrasse in Cologne’s central south. 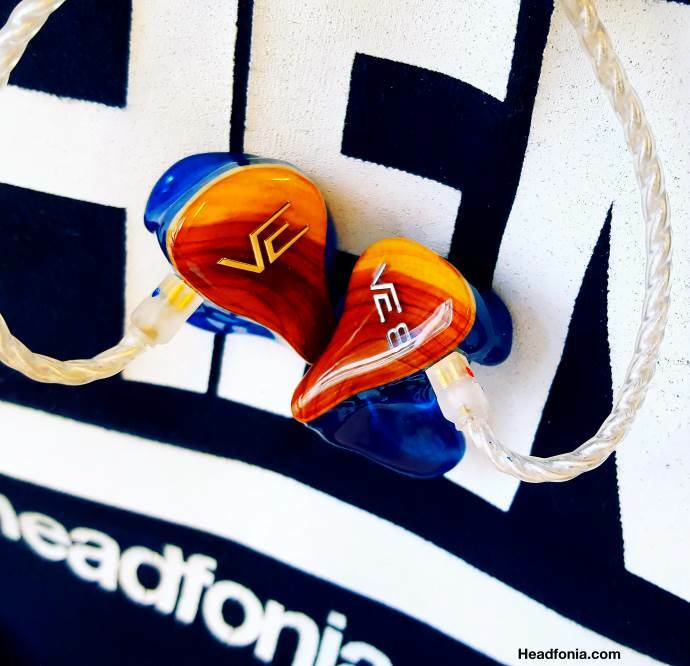 Their optimism and the lucky situation to be able to form a team that is as passionate for In-Ears as the founders are, makes VE a solid and reliable partner for all musicians and audiophiles around the world. Did you know that Vison Ears has something called a “Family Deal”? That means that if you already own one of their monitors, you’ll get a discount on every other new monitor you order. This certainly isn’t something new but I haven’t seen anyone doing it on the record for CIEMs. 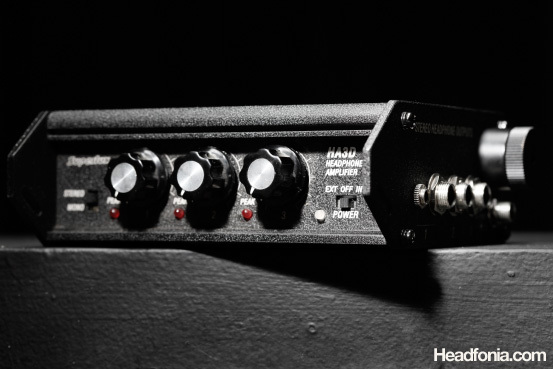 The newest monitor in VE’s line-up is the Vision Ears VE8. An 8-driver monitor in a 2+2+2+2 configuration. That means two Balanced Armatures for the lows/bass, two BA’s for the mids and no less than four! for the treble. The VE is setup in a 3-way system with two bores and its sensitivity is rated at 120dB SPL@1mW with an impedance of 22Ohm. It is the first 8-driver in the VE product range and up to now the famous VE6 XC – which Nathan reviewed – was their top of the line monitor. The eight drivers are extremely popular nowadays and all the CIEM brands are releasing new 8-drivers. A lot of companies have monitors with a higher driver count in their line-up but for Vision Ears, this is their TOTL model. Over the years I have seen all the CIEM companies getting better in making monitors and the build quality nowadays is very high in general. Vision Ears’ monitors however have always been built with the highest precision and their crew has an eye for detail. In my opinion Vision Ears is one of the very best CIEM builders, I guess the German gründlichkeit extends to making monitors as well. 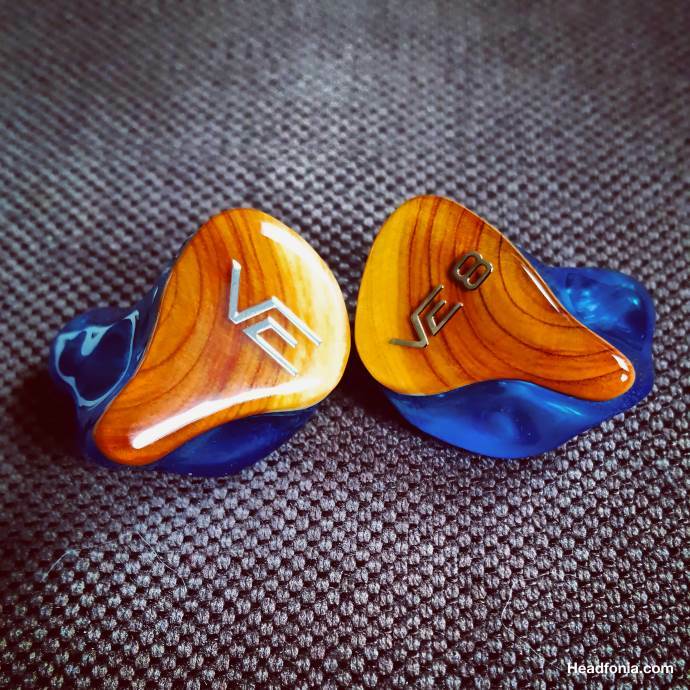 My VE5 and now the Vision Ears VE8 is incredibly well built: solid acrylic shells with no flaws, no bubbles, no bumps, no sharp edges, perfect closing of the face plate, perfectly flush sockets and sublime (by hand) lacquering. Even the insides are very neat looking at wiring, driver placement, etc. Both left and right earpieces are perfectly symmetric on the in- and outside. For and 8-driver CIEM the VE8 is very small in size and I have CIEMs with a lower driver count that are much bigger. Vision Ears still uses the same short canals as they’ve always done. The perfect fit, small size and short canals make the VE8 extremely comfortable to wear, even for very long periods. I never had to refit one of my VE monitors but in case you need to get them corrected, VE will do so free of charge. If I would give scores, the Vision Ears VE would score maximum on build quality, it’s that easy. The number of possible personalization options has boomed these last few years. All the CIEM companies worldwide are borrowing creations from each other and they’re trying to come up with their own. Vision Ears is no different in this regard and they offer a lot of possibilities for the face plates and the acryl shell of the monitors. Face plates come in wood, mirror (like my VE5), carbon, etc. Vision Ears however always points out they only use real materials and no cheap fake copies. I’ve seen their stock of carbon fiber and wood and I can confirm this USP. The artwork on the face plate could be a name or logo or pictures, etc., there hardly are any limits. 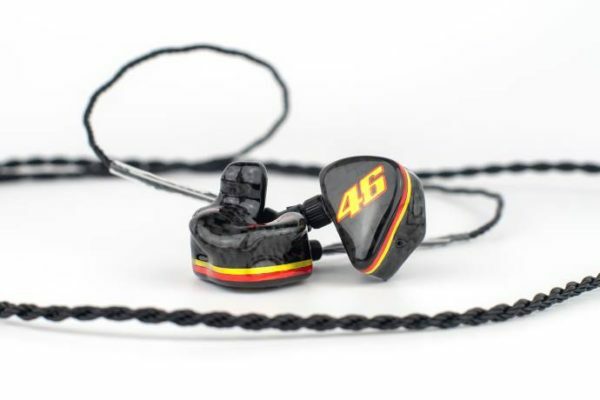 Of course your name/initials/logo will also be (color) labeled on the inside of the in-ear. Amin asked me if I wanted something special but I didn’t really ask for anything in particular. They know I like blue though and as a result they went for a blue acrylic shell. On the inside you can find the VE logo and my first name in white on both the ear pieces. For the face plate, they asked me if I was in to wood and they went for their Trump (wood) finish. As you can see in the picture(s) it’s pretty obvious why they call it the Trump finish. The wooden plate is about 1mm thick and it looks gorgeous with incredible detail. You can see the layering and composition of the wood and the transition of the brown tones from dark to light is just to die for. I have a lot of gorgeous looking monitors but this design ranks high among my favorites. 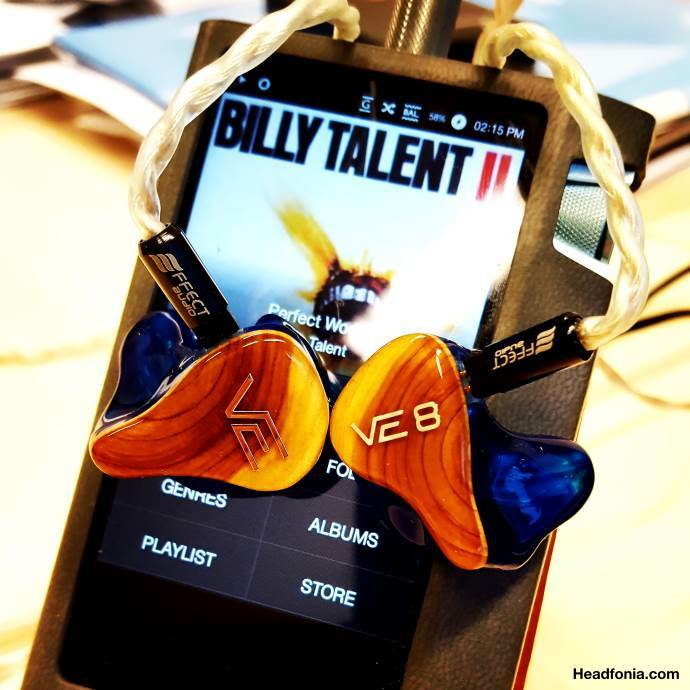 great review, hope you can review the ibasso it03 iem. I have been a loyal reader of your articles. So it’s really delightful to see you comment on ve8 ,which I have also placed an order for. It seems like that I have made a sensible choice XD. The article seemingly to be the first all-round review on ve8 with incredibly comprehensive and lively content.I wonder if I could transfer this brilliant article and share it with my Chinese friends. I will absolutely post the origin and author of the article. Can you please compare to the Kaiser Encore and Campfire Andro? Thanks in advance. Great review. How about the VE8 with the Mars?